We said it was happening and now Lamborghini has officially revealed the Aventador SVJ Roadster at the 2019 Geneva Motor Show - and it's finished in an incredible shade of matte Bronzo Zena. The roadster comes as no surprise after Lamborghini revealed the SVJ Coupe at the 2018 Pebble Beach Concours d’Elegance. Sitting alongside the Huracan Evo Spyder at Lamborghini's Geneva display, the Aventador SJV Roadster looks stunning while retaining the advanced handling and aerodynamic superiority of the coupe. If we break down Mr. Domenicali's words into an easy-to-understand equation: 770 horsepower + no roof = fun. The SVJ nomenclature comes from ‘Super Veloce,' meaning superfast and 'Jota,' a legendary Lamborghini name once used on the Miura. You'd expect such a name to be reserved for a special car, and you'd be right. Like the coupe, the SVJ Roadster uses a 6.5-liter naturally aspirated V12 firing out 770 hp and 531 lb-ft of torque as it revs to a spine-tingling 8,500 rpm redline. The performance metrics, like the V12 engine, are simply marvelous. 0-62 mph takes just 2.9 seconds (just .1 second off the coupe's pace) and the car tops out at over 217 mph. Thanks to massive brakes, the SVJ Roadster can come to a halt from 62 mph in just 31 meters (101 feet). 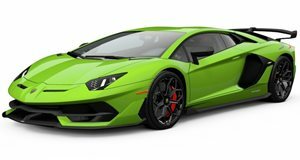 As with a standard Aventador Roadster, Lamborghini has chosen to use two removable panels with quick release levers in the cabin rather than a heavy powered convertible top. This decision helped keep the overall weight down to just 1,525 kilograms (around 3,362 pounds), which is only 50 (110 pounds) kilograms heavier than the coupe. The roadster will be rare, just like the coupe, with only 800 units slated for production. Pricing in the United States starts at $573,966, which is around $56,000 more than the coupe. This may sound like a lot for the privilege of driving without a roof but when you are talking about a half million dollar car, what is another fifty grand or so?